Although they all generally have the same duty (run the offense! ), different point guards in the NBA possess a variety of skills. Whether they are big or small, quick or fast, or aggressive or passive, they come in all shapes and sizes. 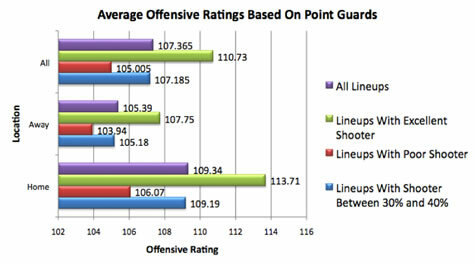 As it turns out, some of the game’s best shooters run the point. Is the ability to shoot three-pointers well a key skill for point guards? Today I’ll take a look. 25.6% of home lineups feature a point guard shooting better than 40% on threes, and 30.05% feature one shooting less than 30%. On the road, those numbers are 25.62% and 30.32%, respectively. It appears as though the ability of your team’s point guard to shoot the three well is very important. Overall, the difference is more than three points per 100 possessions. Similarly, if your point guard struggles with his outside shot, your offense will struggle. Beyond that, I don’t want to say too much. It’s too easy to make bold statements without considering some of the underlying factors, so I’ll just present the data as is. Feel free to draw your own conclusions, though.